The northeast is a very high-risk area for tick-borne diseases, especially Lyme disease. We've collected key facts and information for you to learn more about Lyme disease and how it affects people in our community. With many of us traveling to Martha's Vineyard, and some lucky ones who live there year-round, it's important to be aware of the tick species on the island and the best way to protect ourselves and our families so we can enjoy the beautiful beaches and explore the landscape. Based on the deer density of the island and weather conditions, the tick populations are active in high numbers almost every season. Martha's Vineyard Board of Health reported that in 2011, 25% of people ages 5 to 18 have been treated for Tick-Borne illnesses (TBI) one or more times, and 54% reported a family member being treated for TBI. Tourists especially are at risk as many are not aware of the symptoms and do not seek medical treatment. American Dog Ticks and Deer Ticks are two common tick species found in New England. Both species transmit tick-borne illnesses. Tick bite prevention starts with awareness. 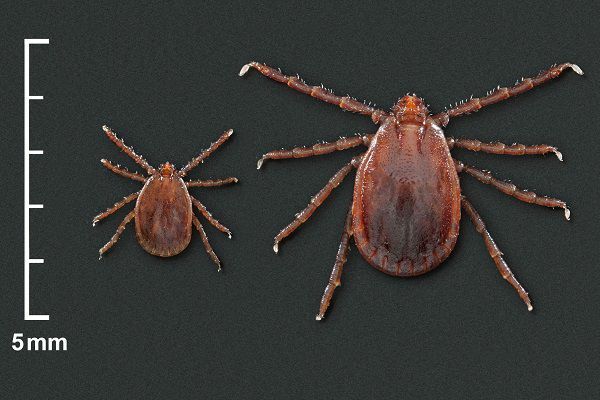 When you understand the behavior, seasonality, and appearence of the tick species in your local environment, you can better protect yourself and your loved one. New England is a hot bed for Lyme disease due to ideal temperatures and accessibility to hosts for deer ticks. Deer ticks are essentially a threat year-round in New England, but can be slowed down by extreme cold or hot temperatures as well as heavy snow fall. They have a two-year life cycle and search for different sized hosts depending on the season and their current life-stage. So why spray for ticks in early Spring?